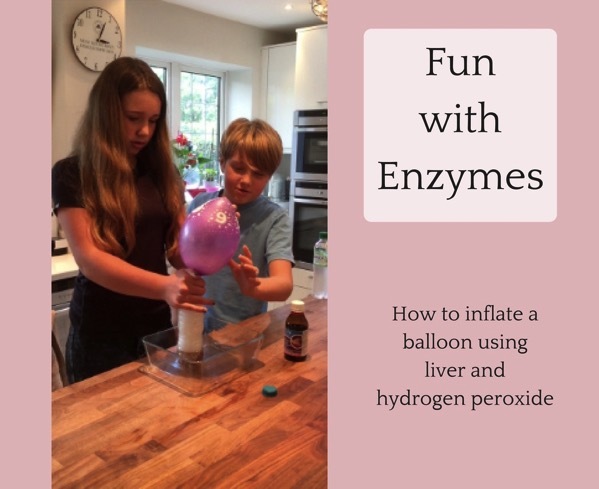 Last week Cordie thought up a fun liver and hydrogen peroxide enzyme experiment. The idea is an interesting extension of elephant toothpaste. And it extends the chemistry learning into biology (useful for homeschool records). When we make elephant toothpaste we use yeast as a catalyst in the breakdown of hydrogen peroxide into water and oxygen gas. By adding soap and food dye, we get oodles of colourful foam that make for a fun and memorable science lesson. You can watch Cordie demonstrating her experiment in the video [4:39] below (with crumpet cameo from Jasper). As soon as the hydrogen peroxide touches the liver, foam appears and the bottle gets warm. After a few seconds the balloon begins to inflate. When you lower the glowing splint into the bottle, the flame rekindles. (My kids’ favourite bit!) There should be enough oxygen to do this over and over again. Just as with elephant toothpaste, the hydrogen peroxide is broken down into water and oxygen in the presence of a catalyst. (A catalyst speeds up chemical reactions without being changed itself.) The reaction is exothermic – it produces heat. Liver contains a biological catalyst, the enzyme catalase. Just as the liver in our experiment breaks down a poisonous chemical into harmless substances, an animal’s liver breaks down toxins and renders them harmless. Heat and cold affect how enzymes work. In Cordie’s science class she timed her experiments using boiled and frozen liver alongside liver at room temperature. If you liked this experiment I’d love you to share it on Facebook or Pinterest. For more about how we homeschool, subscribe to my YouTube channel or like Navigating By Joy on Facebook.